To say MEA member Bryan Forney has come a long way in less than five years would be a radical understatement. On Feb. 20, 2013, the former U.S. Marine Corps lieutenant colonel was trapped in a burning helicopter on a mountain top in Thailand, both knees crushed and his left arm shattered and useless, watching flames cross the ceiling as he thought, I’m not going to make it. This is it. Today he’s a 42-year-old first-year educator at Innovation Central High School in Grand Rapids with a story of how he came to be teaching algebra and astronomy at an urban public high school as miraculous as it is inspirational. Even some doctors didn’t expect Forney to survive following an evacuation flight from Singapore to the military’s only burn center in San Antonio, which set a record as the longest single-leg medevac flight in history—a 19.5-hour trip that required mid-air refueling. “That’s my claim to fame, and I slept through the whole thing so I don’t remember it,” he said, laughing. Five burn and reconstructive surgeons and an orthopedic doctor worked on him simultaneously when he arrived at Brooke Army Medical Center, and more surgeries would follow. Forney lost his entire left kneecap to burn injuries. He fought infections for months and lost half of his right kneecap to infection. He spent five months in the Intensive Care Unit (ICU) and 14 months in a wheelchair. Physical therapy began in the ICU, where a tilt table kept his body used to being upright and therapists did range-of-motion exercises, moving his limbs even while Forney was unconscious. He walks now with a heavy limp on his left side, aided by a set of custom-made Intrepid Dynamic Exoskeletal Orthoses (IDEO) braces—invented in 2010—which strap over his legs and around his feet with a carbon fiber strut up the back of his leg to perform functions that nerve damage and muscle loss prevent his calves and ankles from doing. He wears a prosthetic arm, although recently blistering of scarred skin underneath the socket—which attaches by suction—prevented him from wearing it. Being without his left arm “triples the amount of time it takes me to get ready to go to work in the morning,” he said. Beyond his physical challenges, however, Forney struggles with the same issues facing every teacher—especially new educators. How to manage the workload. How to motivate students. How to teach teenagers challenging concepts in a subject that some find intimidating. He manages three different class preps—Algebra I and II and astronomy—meaning he has three different lessons to prepare each day and lots of grading to manage. He’s trying to figure out how to keep up without cutting into sleep. Stress and lack of rest make him vulnerable to cellulitis, an infection common in burn patients that breaks out in the soft tissue under the skin. He was hospitalized for an outbreak in October, “and if you ask my wife she’ll say it was the result of too many late nights in a row,” he said. His approach to the job focuses on relevance, modeling and practice—with one-on-one attention in class and after school. He reminds students again and again, during class and in private conversations, to study the model solutions posted in Google classroom, abandon the “I can’t” mindset, and jump into the struggle. Forney is challenged by the questions of teaching: how to help students who haven’t mastered the foundational skills from middle school; how to get students to believe in the importance of math; how to build their confidence in their own ability to be successful. Three-quarters of students at Innovation Central High School come from low-income families, and several languages are spoken at the Grand Rapids “theme school,” made up of four college and career prep academies housed in one building. With such diversity, the toughest teaching days for Forney are not when students don’t understand—it’s the times when they don’t try, when they aren’t engaged and they’re distracting others or trying to pull their friends off-task. Watching Forney at work is a lesson in contradictions: He’s slow-moving but high-energy. Intense but quick to laugh. A man covered by scar tissue who’s completely comfortable in his own skin. 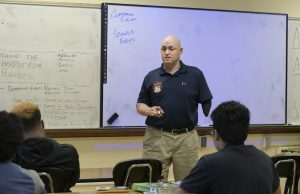 During a 20-year career in the U.S. Marine Corps, former Lt. Col. Bryan Forney earned a Bachelor’s degree in aerospace engineering and a Master’s degree in applied physics. 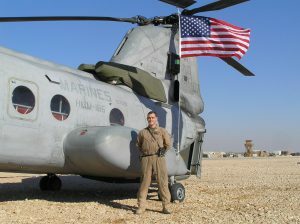 He flew CH-46 helicopters in deployments all over the world, including wartime service in Iraq and Marine Expeditionary Units in Asia, the Middle East, and Australia. He’s also open with students about his story. He tells them everything, and answers questions. Some in his situation might not want to talk about it—Forney understands that—but honest self-reflection is part of his Marine upbringing and a necessary part of being a military pilot. He remembers everything about that day. He was second-in-command of a squadron based on Okinawa, flying a training flight in a mountainous region outside of Phitsanulok, a historic city in Lower Northern Thailand, as part of a multi-national exercise conducted annually. He was demonstrating a “main mount” landing where his CH-46 helicopter lands with the back wheels on a ledge and the front of the aircraft hanging off. With the two crew chiefs doing lookout in the back and focused on avoiding rock crevices, one rear rotor blade hit a tree and broke. With nowhere to set down, staring at a 4,000-foot drop, Forney lifted the helicopter to get back over the mountain, but the loss of power and control felt like “an out-of-balance washing machine times a million,” he said. The aircraft ripped apart and crashed on the mountain top. Both crew chiefs were thrown clear, with one seriously injured. Meanwhile, the co-pilot—briefly knocked unconscious—awoke and was helped out by the uninjured crew chief. Forney, however, was stuck. His side of the helicopter sat up against a pile of rock. His left hand, which had been operating a control, was shattered. The force of the crash had driven his humerus bone into his shoulder socket, and he couldn’t pull himself free of the cockpit. Even after he found a way to get his feet across his co-pilot’s seat, he had no way to pull himself out. There was nothing to grab to his right, and his left arm was flopping and helpless. The fire was burning across the ceiling, and the crew chief called to him. That’s when he figured his life was over, he says. He would never see his wife and three children again. Time stood still. What felt like forever took probably 30 seconds. It took more than three hours for a helicopter to arrive and transport them to a hospital in Phitsanulok. Forney was conscious but felt no pain because of shock and adrenaline. He remembers the emergency room, a nurse intubating him before administering pain medication. After finally being sedated, his awareness of day-to-day events faded for the next few weeks. Junior Oscar Muñoz, who admits to struggling in Algebra II, said it was inspiring to hear Forney’s story in class. 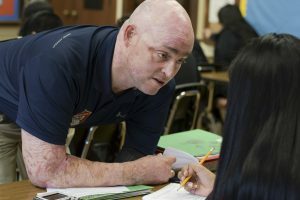 “He’s been through so much, and seeing him being able to teach with his disabilities makes me think I can do more,” Muñoz said. Forney jokes that all he did once he got to the hospital was “not stop breathing,” while doctors, nurses and physical therapists performed the hard work. He acknowledges “tough days” when he felt sorry for himself, but his Marine Corps attitude pulled him through, he said. He credits his wife of 17 years, Jennie, for staying by his side from the accident forward, being his advocate and caregiver, while keeping track of their children’s well-being. Once he was released from the hospital, Jennie did five hours of wound care and bandaging each day. “I wouldn’t have made it without her,” he said. Last summer, Forney retired from the Marines after finishing his service commanding Wounded Warrior Battalion-East Detachment San Antonio—capping a career that included deployments all over the world, including wartime service in Iraq and Marine Expeditionary Units in Asia, the Middle East, and Australia. But it was time for his two sons, ages 14 and 7, and 10-year-old daughter to settle down, he said. The family moved to Lowell, east of Grand Rapids, to be near family. Forney had graduated from Okemos High School in 1993. Growing up in a military family—his dad was an officer in the Marines, and military service goes back generations in his lineage—Forney originally wanted to be a scientist, until he got the flying bug in seventh grade. He earned a Bachelor’s degree in aerospace engineering from the U.S. Naval Academy in Annapolis and attended flight school in Florida for two years before shipping out on one deployment after another for years. He didn’t get the teaching bug until shortly after his first child was born. The Marine Corps sent him to get a Master’s degree in applied physics at the Naval Postgraduate School, then assigned him to teach midshipmen back at the Naval Academy in Maryland. He resisted the idea at first. 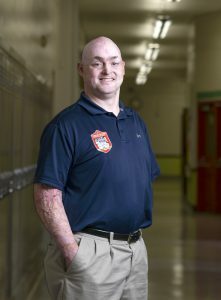 He returned to the idea of being a teacher while recuperating from his injuries and finishing his Marine Corps service, completing a teacher certification program and student teaching in Texas during the past year. He accepted the position in Grand Rapids not long after that, because he’s not good at sitting around, he says. Thank you for your service and perseverance! Perseverance builds character which leads to hope. You are an example of this sir, have a blessed Day!